For my birthday, I indulged myself and got an iPad. Since then, I've been enjoying lots of Fruit Ninja, DoodleJump and Angry Birds. I've also been enjoying Bluefire Reader, an app that works in conjunction with NetGalley so I can read digital ARCs! I have to say, when I decided on the iPad I never thought I would use it as an e-reader. I am very much a traditionalist when it comes to books. I think e-readers are great because they've opened up the market in a whole new one, but I want my books in paperback and hardback, stacked up on my shelves. But, I've found NetGalley to be awesome. Having a digital ARC instead of a paper one reminds me to go out and buy the book when it comes out. It's easy--even with books you really love--to just hold onto your ARC. We're all poor bloggers, after all! But going out and buying--especially right when a book comes out--is so important because it helps out the authors we love by supporting them and letting booksellers and publishers know about that support. Below, I tell you about two galleys I just finished, and will definitely be going out and buying when they come out! This book gave me chills. Like I said before, it's an INTENSE book. I definitely needed a breather after finishing it...which is why I decided to read THE GODDESS TEST by Aimee Carter. The Goddess Test by Aimee Carter is due out 4/19/11 from Harlequin Teen. Again, it was the cover that grabbed me first. How epic is that chick in the white dress? And how cool is it that they put the Greek letters into the title? Here's the Goodreads summary: "Every girl who has taken the test has died. Now it's Kate's turn. It's always been just Kate and her mom--and now her mother is dying. Her last wish? To move back to her childhood home. So Kate's going to start at a new school with no friends, no other family and the fear her mother won't live past the fall. Then she meets Henry. Dark. Tortured. And mesmerizing. He claims to be Hades, god of the Underworld--and if she accepts his bargain, he'll keep her mother alive while Kate tries to pass seven tests. Kate is sure he's crazy--until she sees him bring a girl back from the dead. Now saving her mother seems crazily possible. If she succeeds, she'll become Henry's future bride, and a goddess. If she fails..."
I was totally sold based on the summary! THE GODDESS TEST is a super fun, fast-paced read. I love Greek myths, so this was right up my alley. Carter doesn't waste any time--she jumps right into the action. Before you know it, you're getting the SparkNotes on Greek mythology and trying to figure out just what's up in Kate's world. Henry is mad hot. I would've been really sad if he had been on the page less! As it was, I could've used a few more Henry scenes! Henry is a great twist on the dark and tortured type. Edward Cullen has nothing on him--he's been a vampire for a few hundred years? How about trying to be Lord of the Underworld for a few thousand? Now THAT'S dark and tortured! Carter wrote Henry with an ethereal quality that made him feel like he really had been around for centuries, but also with an innocent, curious side that made him sympathetic and relatable. I really enjoyed reading these books back-to-back. Definitely worth checking out--and they work great as a pair if you're like me, and need a breather in between intense books! So, have any of you checked out these books? Have thoughts on e-readers or NetGalley? What other 2011 books are you looking forward to? I like netgalley,but I went a little crazy thinking I could read a whole bunch of them. 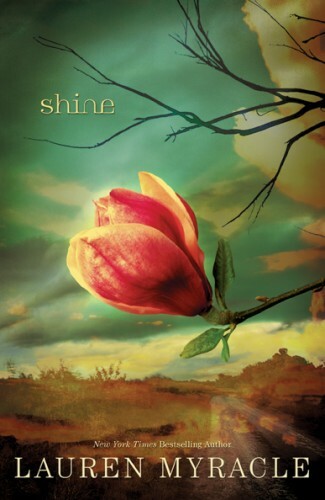 I started Shine book but I got busy with school and it end up expiring. It was really interesting, I wonder if I can redownload it. If not, I definitely think I might put some money aside and buy it.